Evocative symbols and intriguing designs. An air of antiquity that hints of a bygone age. A unique set of elements formed within the structure of a hexagon, combine to create the most beautiful and extraordinary patterns and designs, many that resemble flowers and snowflakes found in nature. At the heart of Arokah lies a previously unknown, naturally occurring phenomenon. Why the Arokah shapes create these remarkable patterns remains a mystery, and is currently being explored by mathematicians at the University of Cambridge. With this unique and fascinating set of Arokah shapes, Steve C. Brazier has created the ultimate brain teaser challenge. A multi puzzle that combines the inherent beauty of nature with puzzle challenges that will test your skill and endurance to the limit! Begin your journey as a ‘Tyro’* and progress through the six levels of ‘Arokah Mastery’. 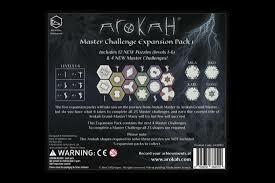 Only then should you attempt to become a ‘Master of Arokah’ by successfully completing one or more of the ‘Master Challenges’! 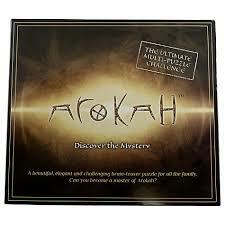 Once a ‘Master of Arokah’ you will be ready to challenge for the highly esteemed title of ‘Doyen’** and add to your record of achievement by attempting further ‘Master Challenges’. *(Tyro – noun – a beginner or novice). **(Doyen – noun – the most respected or prominent person in a particular field). 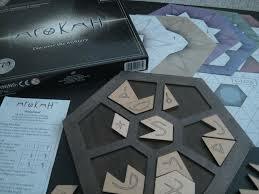 Arokah is a beautifully designed wooden puzzle game which consists of a dark wooden hexagonal board, 23 light wood puzzle pieces, 12 puzzle challenges and 3 master challenges. The aim is to use the puzzle pieces to make shapes on the hexagonal board. 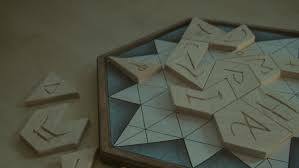 Now I know that sounds easy but it isn’t when you factor in that you have a predetermined shape to make for each of the challenges, no 2 pieces are the same and all the pieces must be placed symbol side up. I had a lot of fun with this game because each challenge has multiple ways that it can be completed, and you can challenge yourself to beat your best time, whilst this is not a game that I would necessarily have picked up if I’d seen it in my local game store I think that this makes it somewhat of a hidden gem. Even packing the game away becomes a puzzle as you have to fit all 23 pieces into the reverse of the board, which got quite frustrating as it’s not that easy to put away quickly. I received this game as part of Asmodee UK Blogger Board Game Club in return for this post.